I was up at 5:00 am yesterday, Central time, and fell asleep early last night. I was up early this morning and decided to walk. LA is famous for the observation that nobody walks, but of course, that's not true. Lots of people are walking at 8:00am. Many of them, dressed in scrubs, or jeans and casual clothes, or uniforms, are walking to or from bus stops. Most of them are brown or black. The one white woman I saw was older, wearing a long denim skirt and a dirty sweatshirt and either had no access to or didn't much use shower and laundry. But that's not what we mean or what we see when we talk about people walking. It's warm here. Of course it's warm here. I'm in Los Angeles, it's supposed to be warm. Tomorrow I'll embark on an apartment hunt. In preparation for this, I've been watching a lot of real estate shows on HGTV. On HGTV I've learned a lot about looking for a place to live. I've learned you have to compromise. Which is good because I've been living in house. With bedrooms and a husband and dogs. Now I'll be living in an apartment, and talking to said husband and dogs by Skype. HGTV also says that I can reasonably expect to spend a third of my income on rent. They are joking. But it doesn't matter, because a third of my income doesn't get me a place that is qualitatively better than what I actually think I can afford to pay. To get a place that is qualitatively better--significantly more square feet, say, and nicely made, rather than the basic box, would cost me about my average income. However, I have finally tried In-and-Out Burger. I see what everyone was talking about. Saw Laurie Anderson in concert once years ago. Saw this album in a used book store today, and suddenly had to hear the song. Gotta wonder who thought these were good ideas to print on their skin forever. 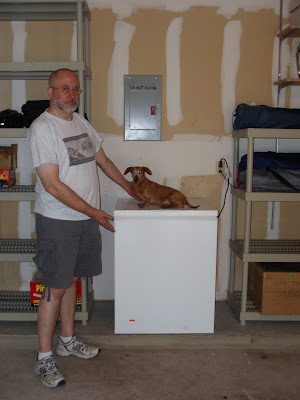 Bob, showing off the freezer Price is Right style. 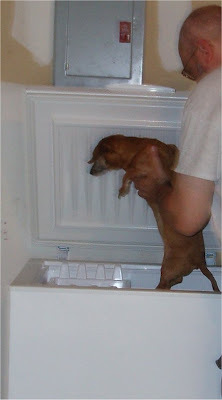 Bob prepares the first test of the freezer. They said it would be cold in about five hours. Watering my tomatoes this morning, I found this. 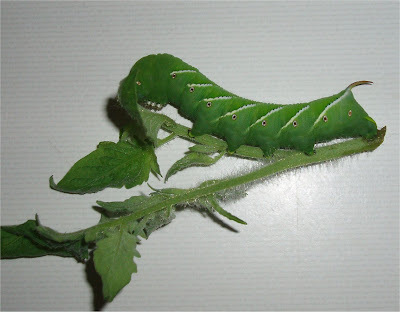 It's a tobacco hornworm, the caterpillar form of the hummingbird moth. I will be watching for more, and if I am infested I will have to buy some Bacillus thuringiensis and visit plague upon the little buggers. It is cool looking, though. Bob and I were quite interested and looked it up and everything. It's tempting to try to make a horror movie out of the thing, except it won't move. It just clings to it's tomato stalk.